If you're looking for unique, festive, Fall-themed food, then look no further. This spiked pumpkin pie grilled cheese with tangy goat cheese is the perfect treat for the holiday season! 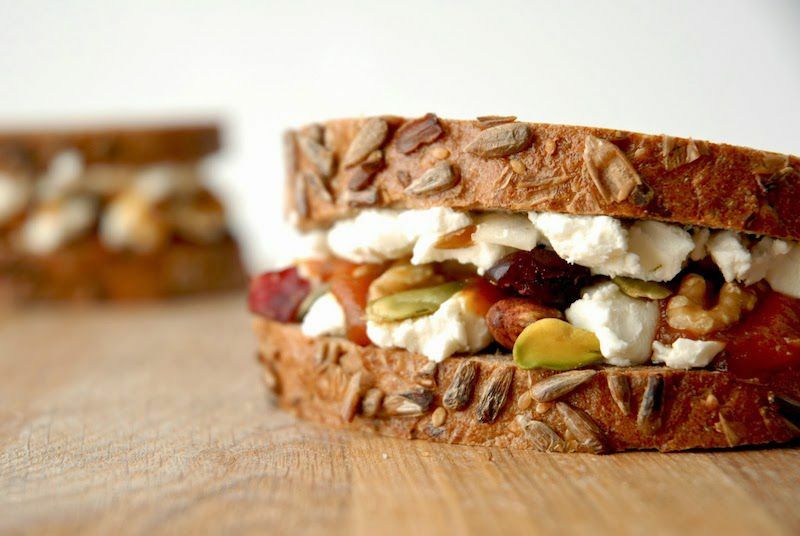 Made with slow cooker pumpkin butter, tangy goat cheese, crunchy candied nuts, and hearty, buttery toasted bread, this sandwich can be served as lunch, dinner or dessert. This homemade pumpkin butter is utterly simple to make. Just mix the ingredients, put it in the slow cooker while occasionally stirring until a rich, thick velvety butter develops. And if you don't want to spend time making the pumpkin butter, just check out your local grocer or specialty food store during the holiday season. Trader Joe's, Whole Foods and many more national chains typically carry it during the holiday season. Looking to make things even more interesting? Try making the sandwich on cinnamon swirl bread. Don't do alcohol? No worries, you can simply swap it out for 1/2 cup apple juice and enjoy! Spray crockpot with nonstick spray and then combine all ingredients in a bowl and stir until smooth. Pour the mixed ingredients into the crockpot and turn the crockpot on to high heat with the lid. Let the pumpkin butter cook for at least 2 hours, or up to a maximum of 4 hours. Try to stir and scrape the sides every hour or so, this way the mixture does not stick to the crockpot. When it's done, it will be thick and creamy. If it needs some added richness, feel free to stir actual butter into the mixture. When it has thickened and become creamy, remove from heat, allow to cool, and then store in an airtight jar with a fastened lid. Begin by smearing, or crumbling, the goat cheese onto one slice of bread. Place the pumpkin butter on top and sprinkle it with the candied nuts. Add the rest of the goat cheese to the other slice of bread and place it on top. Smear butter onto the exterior of the sandwich and place it in a cast iron skillet, or a panini press. Turn the heat to medium-high and cook until the crust is golden and the goat cheese has softened and is warm in the middle. Make sure to flip if needed. Once the sandwich is done, remove from heat and let the sandwich sit for a minute to help thicken the ingredients back up. Cut it in half and serve immediately.